MSG, or monosodium glutamate, has no taste by itself, but it is used by many professional cooks as a flavor enhancer, improving and enhancing the flavor of almost any food. The taste that is enhanced by MSG is different than the standard sour, sweet, bitter and salty flavors – it is called “umami,” which also is enhanced by substances like soy sauce. It’s the savory flavor that one finds that is different from the commonly stated “four tastes” that chefs used to consider when developing flavors for food. The taste-enhancing quality of MSG is not well understood, but it’s possible that humans evolved the pleasurable taste of umami as a result of natural selection favoring those who had a pleasurable reaction to eating high-quality protein foods – that is, the food that provides more nutrients (proteins) tastes better. Protein is a critical aspect of a “healthy” diet – without appropriate levels of protein, a human can experience symptoms as benign as hair loss or as serious as immune deficiency. We need our protein. MSG has been used as a flavor enhancer for several thousand years. It is one of the key components of many Asian cuisines, especially in the Japanese and Chinese cultures, who have extracted MSG from kelp for centuries. The Romans used a sauce called garum, made from fermented fish, that was used instead of more expensive salt. Garum is rich in monosodium glutamate, so the use of MSG isn’t a product of modern chemistry, but has been around for thousands of years. MSG was discovered and identified in 1866 by a German chemist who treated wheat gluten (oh geez, I see the conspiracies forming about evil gluten) with sulfuric acid. In 1908, a Japanese scientists, Kikunae Ikea, isolated glutamic acid as a taste substance in 1908 from the seaweed. He called its taste umami. In other words, from a scientific and pragmatic point of view, MSG is a natural substance from naturally grown plants. MSG wasn’t invented by Monsanto and forced down the throat of innocent people everywhere. It’s been a flavor enhancer for a few millennia. I know this is can be annoying, but let’s look at some of the science. First, what is MSG? This is the point that makes many scientists laugh because MSG, or monosodium glutamate, is simply the sodium salt, or the ionic form, of glutamic acid, an amino acid which is one of the building blocks of most proteins. All proteins are a chain of amino acids, one of which is glutamic acid. You consume glutamic acid from almost every food you eat from grains to meat since it’s a constituent part of probably every protein found on the planet. Some grain proteins have over 30% by weight glutamic acid. Since glutamic acid doesn’t exist except in the presence of water, it precipitates with sodium or other cations (potassium, lithium, and others). Hence, the “monosodium” part of MSG. Precipitated salts do not change it’s essential chemical nature, because a glutamate ion does not exist without water unless it combines with a cation. So, the MSG you find in powdered form will immediately split into a sodium ion and glutamate ion – and the body can use that glutamate for any biochemical process it wants, and excess sodium is excreted through the kidneys. Here’s the actual science behind glutamates (you can ignore this paragraph, if chemistry makes your eyes glaze over). When glutamic acid or one of its salts is dissolved in aqueous solutions, a pH-dependent instantaneous chemical equilibrium of the amino acid’s ionized forms, including zwitterionic forms, will result. These forms are called glutamates. Salts exist only in a dry and crystallized form. The form ultimately responsible for the taste is the glutamate ion, and the form of glutamic acid at the time of the addition is not important. However, crystalline glutamic acid salts such as monosodium glutamate dissolve much better and faster than crystalline glutamic acid, a property important for use as a flavor enhancer. Glutamic acid, one of the amino acids upon which nearly every single protein is built in the human body, is chemically indistinguishable from the acid salt, MSG. Once you ingest MSG, it dissociates into sodium and the glutamate, which will be absorbed and utilized by the body. Moreover, all glutamates are the same – if they are manufactured by a human cell, a plant, some algae, or a chemistry laboratory, they are chemically identical. Glutamic acid does not suddenly change properties when in salt form. Once it’s consumed, the glutamate separates from the sodium and binds with hydrogen to become an acid again. The sodium is either utilized by the body or excreted through the kidneys. It’s a simple physiological process, no mystery at all. 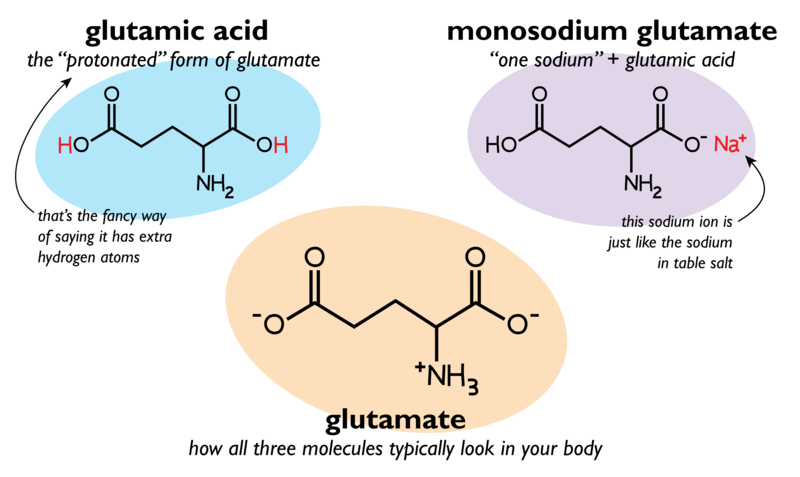 All forms of glutamate/glutamic acid/MSG are exactly the same from a chemical standpoint. The human body cannot tell the difference between the amino acid, glutamic acid/ the salt form of that acid, monosodium glutamate; or the ionic form, glutamate. You might want to invent some difference between the three forms, to make some case that MSG is more dangerous, but that would require a complete rewriting of what we know about basic chemistry. And you’d win a Nobel Prize for doing so. Let me repeat myself (just because this is one of the points of contention) – once you ingest MSG into the liquid environment of the stomach, and it simply dissociates back into one sodium ion and one glutamate ion, and the glutamate is absorbed into the blood to create new proteins. And that glutamate ion is exactly the same as the glutamate ion that will be broken down from every single protein consumed. It’s very simple chemistry, about the simplest I could describe in human physiology. The body produces glutamate (or glutamic acid more properly) during various cellular processes, including the citric acid cycle, or Kreb’s cycle, which is a complex metabolic system fundamental to how the cell builds proteins and provides energy. So, if you avoid MSG/glutamate in your food (which is pretty much impossible), don’t worry, your body will produce all the glutamate it needs to survive. Because we definitely need glutamate to survive. Glutamate is also a key compound in eliminating and controlling the waste nitrogen in the body (which is created by cells in the form of urea). It is also a neurotransmitter, used by nerve cells to transmit certain types of information, and is a critical substance in cognitive functions in memory and learning. In other words, glutamate is very important in your life. Without it, you will probably die. Or at least not be able to think. So if you eat a lot of glutamate in your food, and your body synthesizes glutamate in substantial quantities, is there anything bad about MSG? Well, there may be an issue that might arise. MSG does have a sodium ion, but it’s actually less by weight than an equivalent amount of table salt. Interestingly, in a 1984 Journal of Food Science article, MSG may actually be useful in reducing sodium consumption while not compromising taste in savory foods. Salt is considered a fundamental additive to good tasting savory foods, and MSG could make an improved taste, with less sodium. In fact, I’ve always contended that many of the symptoms observed after eating Chinese food have more to do with sodium since a lot of components of Chinese food includes soy sauce, a high salt ingredient. MSG does contribute sodium to the equation, so it might actually add to the sodium burden of the food. High salt consumption has a lot of effects that mirror the complaints about MSG itself. But after a few hours, a well-functioning kidney will clear out the extra sodium (as long as you drink a lot of water). And usually within those few hours, you are back to normal sodium, and all that glutamate you consumed has been incorporated into billions of proteins in your body. The MSG myth probably started with personal anecdotes after eating Chinese food. In 1968, a physician complained about radiating pain in his arms, weakness and heart palpitations after eating at Chinese restaurants. He wrote about his personal experience in a letter to the New England Journal of Medicine. However, the physician hypothesized that either cooking wine, MSG or excessive salt might be problematic. Other letters were published stating similar experiences after consuming Chinese food. A 1969 article in Science claimed there was a dose-response relationship between Chinese food and the Chinese Restaurant Syndrome (CRS). But the study did not isolate MSG as the cause and was not blinded (which would be nearly impossible if were to determine if the cause was the food rather than the ingredients). Unfortunately, the study has never been repeated, so it’s impossible to determine if it provides evidence that Chinese food does anything, let alone MSG. That MSG causes health problems may have thrived on racially charged biases and xenophobia right from the outset. Ian Mosby, a food historian, wrote in a 2009 paper titled “‘That Won-Ton Soup Headache’: The Chinese Restaurant Syndrome, MSG and the Making of American Food, 1968-1980” that fear of MSG in Chinese food is part of the U.S.’s long history of viewing the “exotic” cuisine of Asia as dangerous or dirty. And of course, the usual suspects in pushing food and medical ignorance love to pontificate on MSG, even today. Joe Mercola, one of the leading purveyors of nonsense science and medicine, calls MSG “the silent killer lurking in your kitchen cabinets.” Oh, my. His claims are based on a belief that MSG is an excitotoxin, which causes a pathological process by which nerve cells are damaged and killed by excessive stimulation by neurotransmitters. This pseudoscience is promoted by Dr. Russell Blaylock, a board-certified neurosurgeon and author of “Excitotoxins: The Taste that Kills.” Setting aside the Appeal to Authority (a board-certified neurosurgeon may not have any actual knowledge of neurochemistry), a book isn’t necessarily a high-quality source. But Mercola doesn’t stop there. He also believes that MSG causes obesity, eye damage, headaches, fatigue, disorientation, depression, and a whole host of other maladies. And he states that up to 40% of the US population may be impacted by MSG. Thus, you can see that the whole MSG-causes-neurological-issues is based on pseudoscience. There is little independent, robust, and unbiased evidence that MSG does anything to nerve cells. In fact, you consume so much glutamate in normal food, if there were things like MSG and neurological issues, it would be so prevalent that the human species would have died out long ago. Some science writers have made claims that a small subset of people has real negative reactions due to glutamate. I think that this is based on the relationship between the glutamate ion and neural transmitters, but it’s difficult to find any plausibility that one could consume enough glutamate to impact that. Like I’ve mentioned previously with other foods, the body has inherent mechanisms to regulate itself. Moreover, I have not found any consensus and compelling scientific evidence at all that supports even a minor incidence of MSG sensitivity. As for the excitoxin nonsense associated with MSG, there is just no evidence that glutamate can cross the blood-brain barrier, and there is no evidence that excessive consumption of MSG actually raises the blood levels of free glutamate. 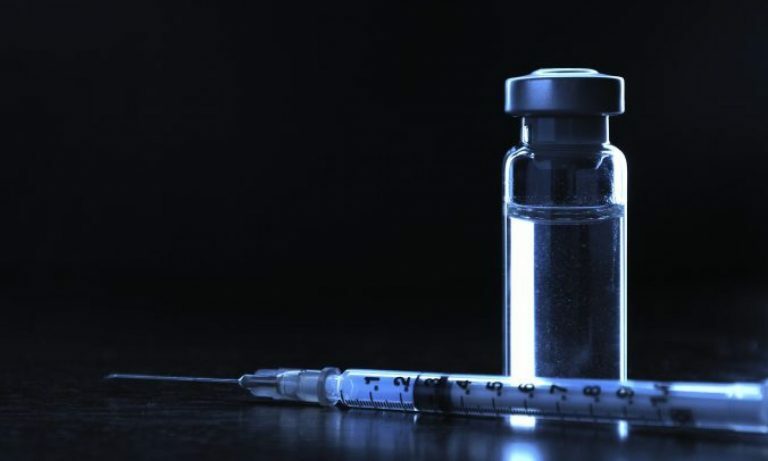 In a meta-review of the effect of MSG on asthma patients, the authors concluded that “there is no evidence to support the avoidance of MSG in adults with chronic asthma.” Now the review authors did state that there is very little research that has been completed, but even the preliminary research tells us it’s probably safe for a group, asthmatics, who are very sensitive to allergens. This study helps us reject the belief that there’s even a tiny percentage of people who may be sensitive to MSG. In another systematic analysis, considered to be the pinnacle of the hierarchy of scientific research, the authors could not find a correlation between MSG consumption and headaches. In studies of MSG in food, human research has shown no known correlation between consumption of MSG and headaches. However, in poorly blinded studies of MSG alone (the flavor makes it difficult to blind), there seems to be a higher incidence of headaches with MSG, but the lack of proper blinding made it difficult to show a causal relationship. These review articles, which are meta-analyses of a large number of primary research articles, along with clinical trials, just don’t support the MSG myth. There might be a small subpopulation of people who are sensitive to MSG, but even that has little support in the scientific evidence and is completely dismissed in systematic reviews. It is possible that Chinese food itself causes CRS. The food is saltier. It is filling. It can be high in carbohydrates and oils. In other words, other substances within the food may have the same exact effect as what is claimed by MSG alone. Funny thing is that soy sauce is higher in free glutamate (as discussed above, the form of MSG in solution) than what is used by most cooks. So are tomatoes. So are dozens of other foods. In fact, according to a report by Food Standards Australia New Zealand, a typical Chinese restaurant meal will have between 10-1500 mg glutamate per 100 g food. Soy sauce has 400-1200 mg/100g. Vegemite (for my Australian readers) has about 1400 mg/100g. Parmesan cheese has around 1200 mg/100g. Tomatoes have around 200 mg/100g. In other words, your typical Italian meal (with tomato sauce and Parmesan) may provide more glutamate than your typical Chinese meal. Ms. Barry-Jester at FiveThirtyEight.com, whom I mentioned above, may be on to another cause of this myth. She cites an article by Ian Mosby in the journal Social History of Medicine that concludes that “Chinese restaurant syndrome was, at its core, a product of a racialised discourse that framed much of the scientific, medical and popular discussion surrounding the condition.” Yes, racism may actually be the core of the MSG myth. MSG is just a simple salt of glutamic acid, one of the 20 or so amino acids that are the building blocks of every protein in the body. The glutamate in MSG is indistinguishable, even at the atomic level, from all other glutamates on the planet. All of them. The glutamate in seaweed or manufactured from some process in a lab are equivalent to the ones produced by humans. Almost everyone who claims an MSG sensitivity does not base that on anything but their personal experience. Anecdotes. They remember the one time that they might have had MSG but forget all the times they felt fine after having sushi with soy sauce. Or a BBQ sauce that contains soy sauce and tomato sauce. And maybe the whole MSG myth has a strong root in the racial attitudes of 1960s-70s America regarding Asians. MSG is perfectly safe. Go have a spoonful. Or put it on your food, because it does make it tastier. But it isn’t going to hurt you unless for some illogical reason you think it will. Editor’s note: This article was originally published in December 2012. It has been revised and updated to include some more chemistry (fun), fix some broken links, copyedit some bay copyediting, and add some more current information. I frequently update older articles to make sure they remain current and useful in discussions. Food Standards Australia New Zealand. MONOSODIUM GLUTAMATE: A Safety Assessment (pdf). TECHNICAL REPORT SERIES NO. 20. 2003 June. Freeman M. Reconsidering the effects of monosodium glutamate: a literature review. J Am Acad Nurse Pract. 2006 Oct;18(10):482-6. Review. PubMed PMID: 16999713. Geha RS, Beiser A, Ren C, Patterson R, Greenberger PA, Grammer LC, Ditto AM, Harris KE, Shaughnessy MA, Yarnold PR, Corren J, Saxon A. Review of alleged reaction to monosodium glutamate and outcome of a multicenter double-blind placebo-controlled study. J Nutr. 2000 Apr;130(4S Suppl):1058S-62S. Review. PubMed PMID: 10736382. Hawkins RA. The blood-brain barrier and glutamate. Am J Clin Nutr. 2009 Sep;90(3):867S-874S. doi: 10.3945/ajcn.2009.27462BB. Epub 2009 Jul 1. PubMed PMID: 19571220; PubMed Central PMCID: PMC3136011. Jinap S, Hajeb P. Glutamate. Its applications in food and contribution to health. Appetite. 2010 Aug;55(1):1-10. doi: 10.1016/j.appet.2010.05.002. Epub 2010 May 12. Review. PubMed PMID: 20470841. Mosby I. ‘That Won-Ton Soup Headache’: The Chinese Restaurant Syndrome, MSG and the Making of American Food, 1968–1980. Soc Hist Med. 2009 January; 22 (1): 133-151. Obayashi Y, Nagamura Y. Does monosodium glutamate really cause headache? : a systematic review of human studies. J Headache Pain. 2016;17:54. doi: 10.1186/s10194-016-0639-4. Review. PubMed PMID: 27189588; PubMed Central PMCID: PMC4870486. Samuels A. Monosodium glutamate is not associated with obesity or a greater prevalence of weight gain over 5 years: findings from the Jiangsu Nutrition Study of Chinese adults–comments by Samuels. Br J Nutr. 2010 Dec;104(11):1729; author reply 1730. doi: 10.1017/S0007114510002758. Epub 2010 Aug 9. PubMed PMID: 20691132. Schaumburg HH, Byck R, Gerstl R, Mashman JH. Monosodium L-glutamate: its pharmacology and role in the Chinese restaurant syndrome. Science. 1969 Feb 21;163(3869):826-8. PubMed PMID: 5764480. Williams AN, Woessner KM. Monosodium glutamate ‘allergy’: menace or myth? Clin Exp Allergy. 2009 May;39(5):640-6. doi: 10.1111/j.1365-2222.2009.03221.x. Epub 2009 Apr 6. Review. PubMed PMID: 19389112. Yamaguchi SY, Takahashi C. Interactions of Monosodium Glutamate and Sodium Chloride on Saltiness and Palatability of a Clear Soup. Journal of Food Science. 1984 January; 49(1):82–85. DOI: 10.1111/j.1365-2621.1984.tb13675.x. Zhou Y, Yang M, Dong BR. Monosodium glutamate avoidance for chronic asthma in adults and children. Cochrane Database Syst Rev. 2012 Jun 13;6:CD004357. doi: 10.1002/14651858.CD004357.pub4. Review. PubMed PMID: 22696342.